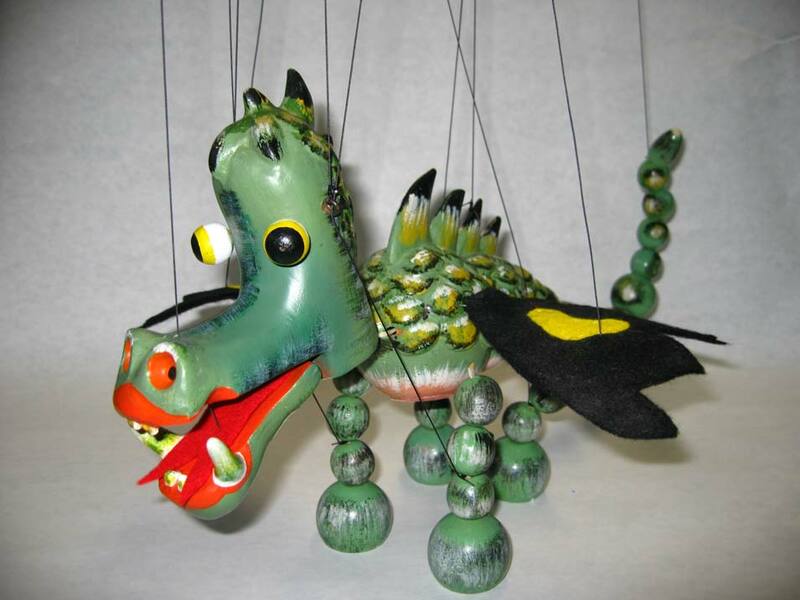 The Fratello Marionettes specializes in restoring all types of puppets and marionettes. Clients entrust their heirlooms to us because of our experience, expertise, care and attention to detail. Basic restoration includes 25 lb. 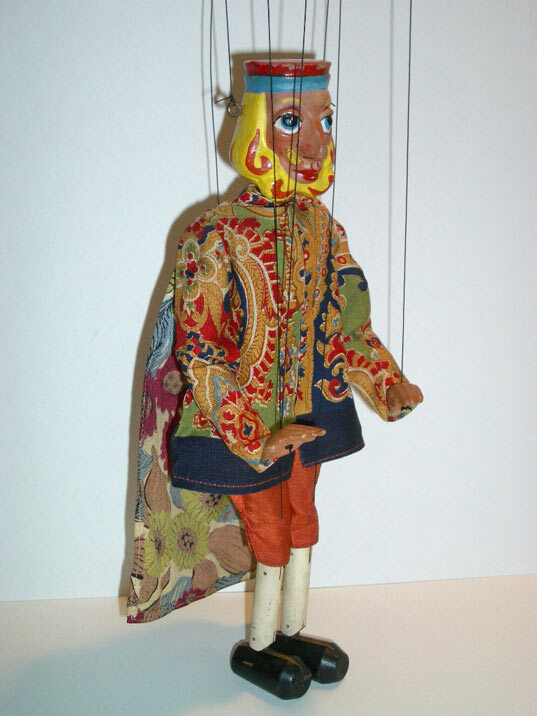 black marionette string, cleaning of painted surfaces, minor repairs and tuning. More services, including paint and costume repair, are available for an additional fee – please contact us for a quote. Please include your return shipping address. Customer is responsible for any excess shipping costs due to weight or size. 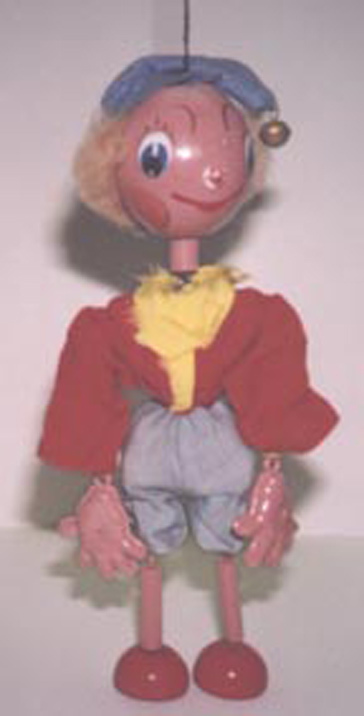 Please pack puppets carefully with bubble wrap and packing peanuts. Repair work for any damage caused by improper packing will be an additional fee added to the standard quoted restoration services. 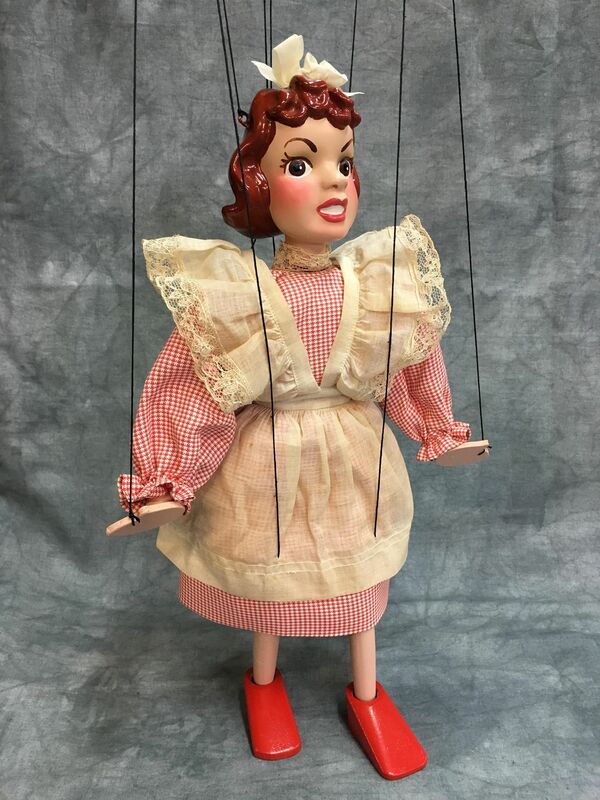 This vintage marionette was covered in a heavy layer of dirt and soot. Each part was carefully separated and thoroughly cleaned, then reassembled with new waxed linen thread. 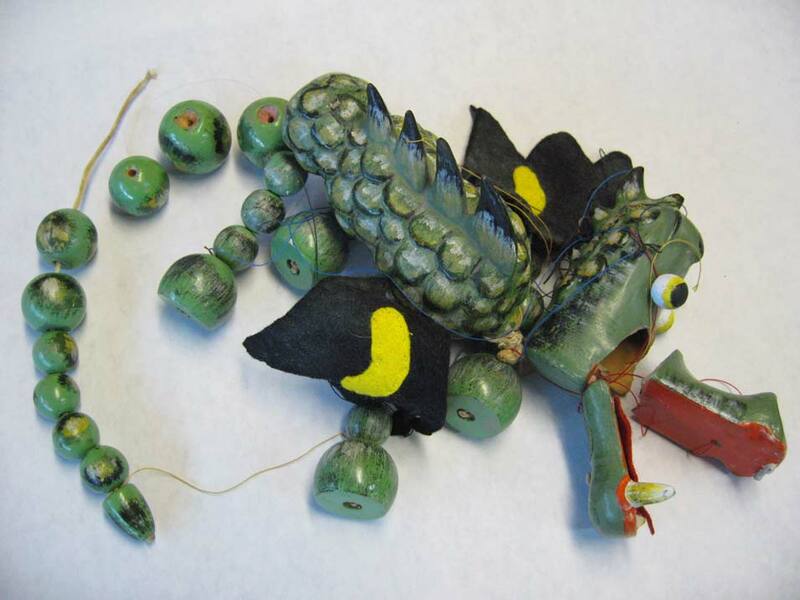 The disintegrated rubber bands on the control were replaced and new black braided marionette string was used for restringing. 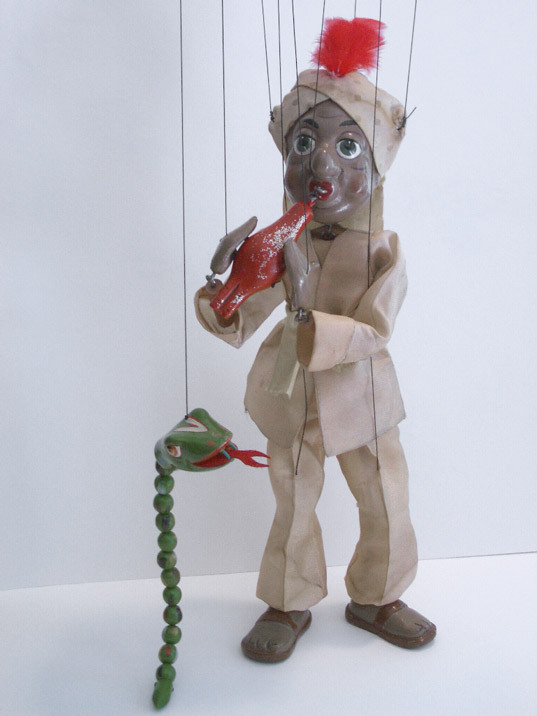 The clothing on this rare 1950s Snake Charmer was removed, hand washed and pressed. 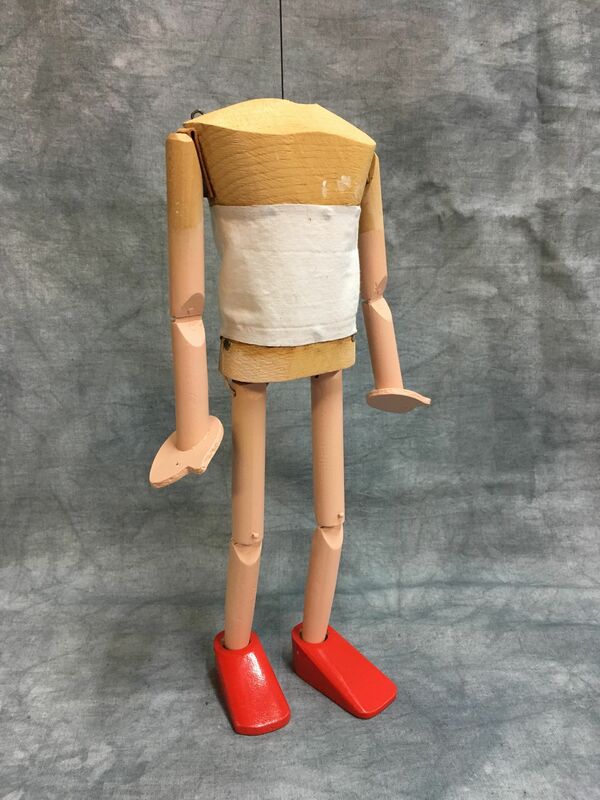 The painted parts were carefully cleaned and the broken ankle joints were replaced. A fresh red feather replaced the disintegrated one, and new black braided marionette string was used for restringing. The clothing on this rare 1950s King from the Alice in Wonderland series was removed, hand washed and pressed. 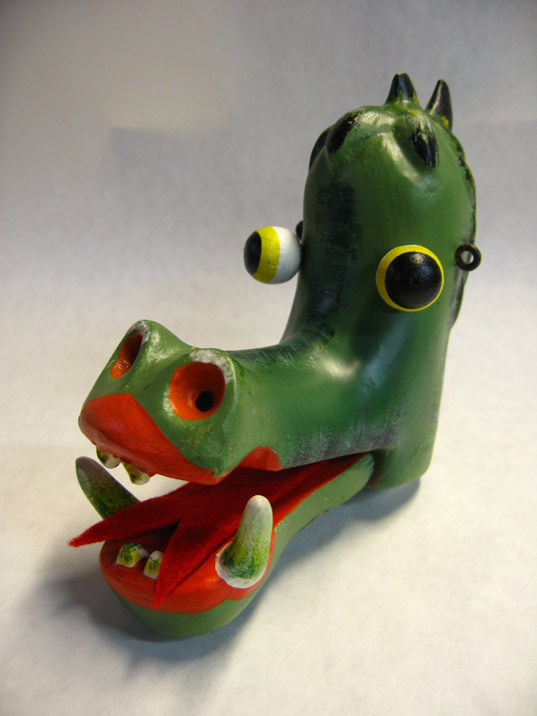 The King’s neck and head were reattached and the painted parts were carefully cleaned. Lastly, the strings were replaced with new black braided marionette string. 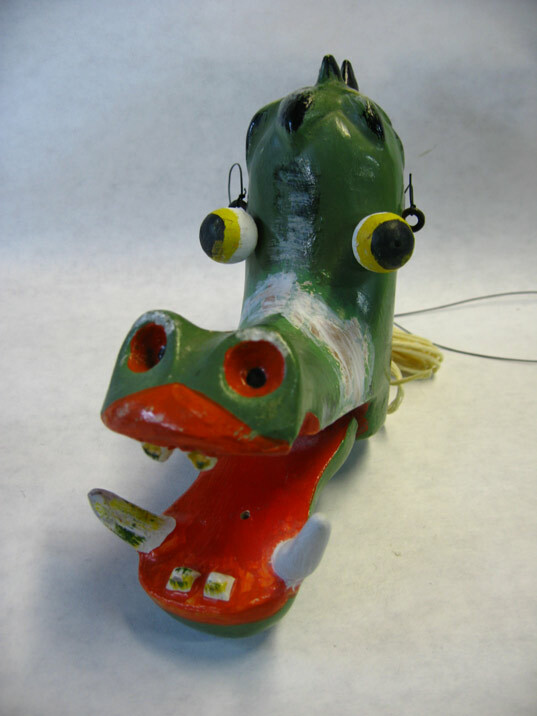 This 1960s motorized display unit required extensive restoration. 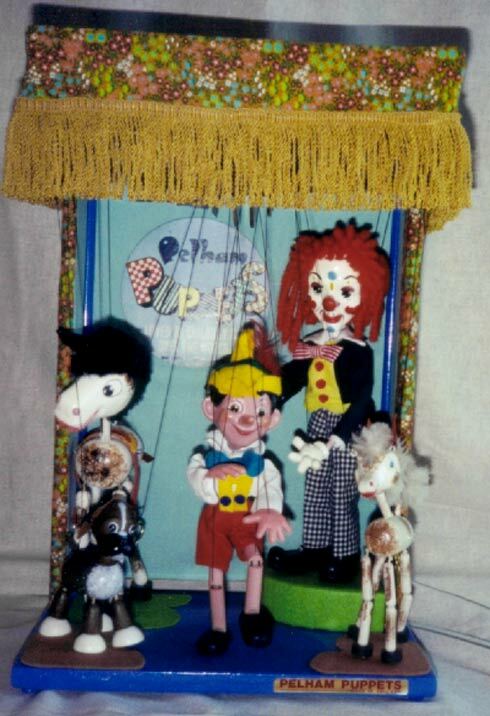 The original puppets were too faded and damaged to reuse, so new puppets were acquired. The fabric covering was removed and vintage fabric and trim were patterned after the original. The felt shapes on the floor were removed and patterned, and wool felt was dyed to match the original colors. 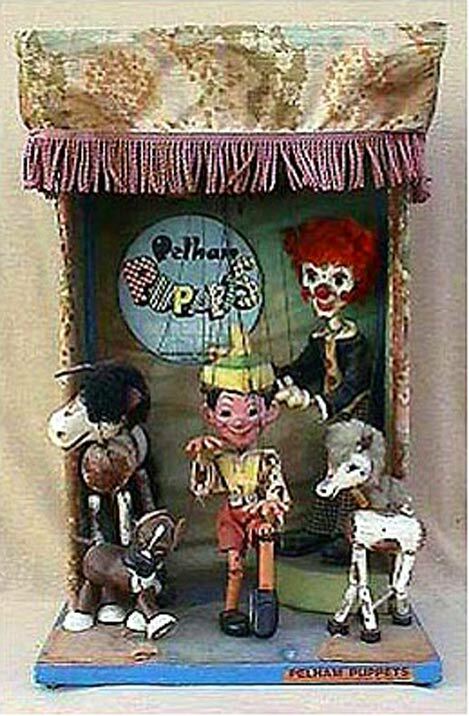 The wooden structure was repainted to match the original shade, and the puppets were restrung with new black braided marionette string. 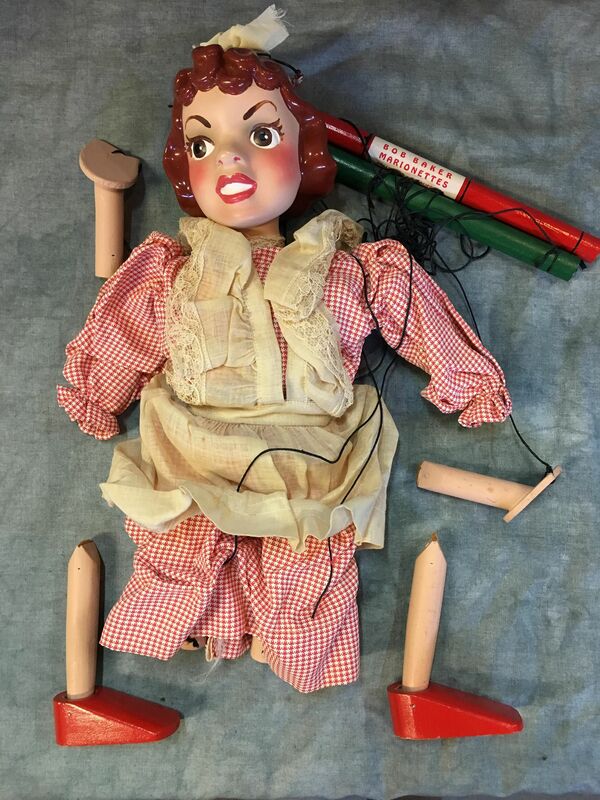 This rare 1940s marionette modeled after Judy Garland had her clothes removed, hand washed and pressed. The disintegrated leather joints were replaced, along with cleaning all the painted parts. The legs and arms were repainted matching the original flesh tone. 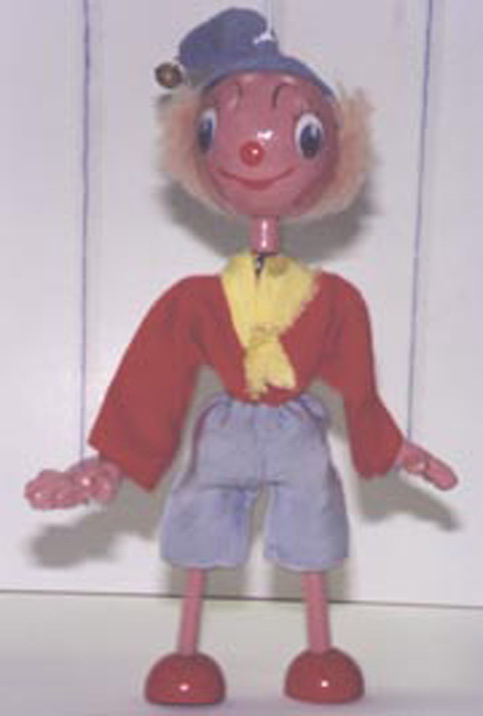 Lastly, the original strings were reattached to the finished puppet. 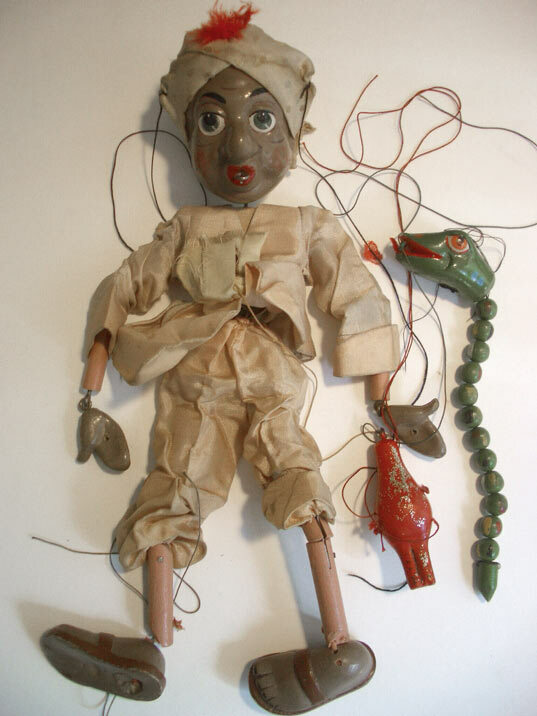 The clothing on this early 1900s Czech marionette was removed, hand washed and pressed. The painted parts were carefully cleaned and the hair was combed and set. 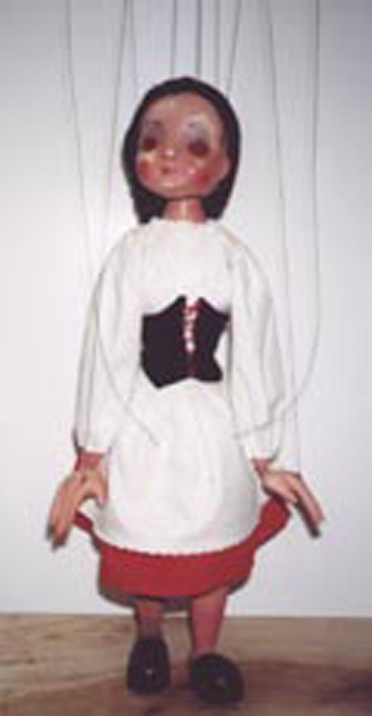 Her strings were replaced with new black braided marionette string. 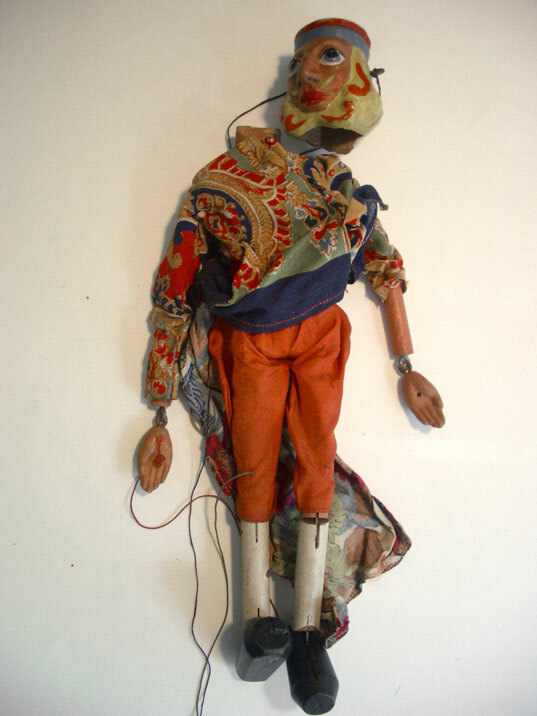 The clothing on this 1960s marionette was removed, hand washed and pressed. The painted parts were carefully cleaned and the nose was repainted because of extensive chipping. His strings were replaced with new black braided marionette string and new elastic was added for his head.